When creating a new email from the Creative tab, you'll be presented with the two options: GatorCreator (our drag and drop editor) or GatorMail (our HTML editor). Select GatorCreator and Create New Email to begin. 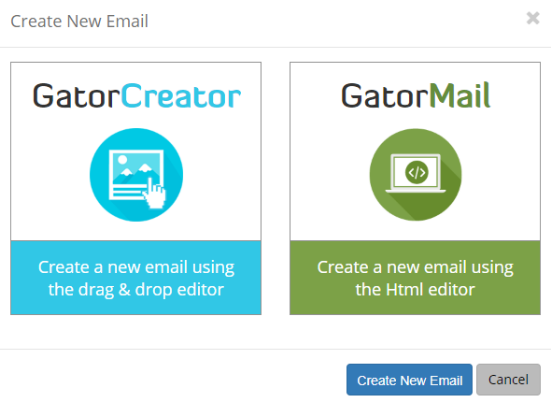 Once you've selected GatorCreator to build your email creative, this is where you'll begin. 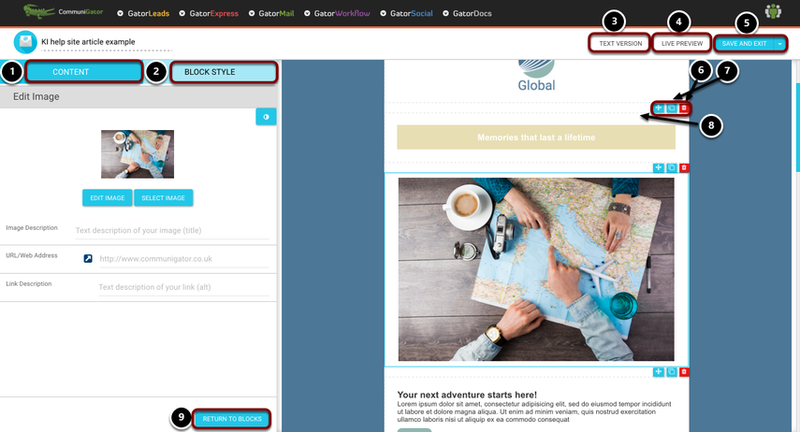 There are four different template areas for you to choose from, as highlighted above. You can click on each of these tabs to preview the template options available to you. 1. 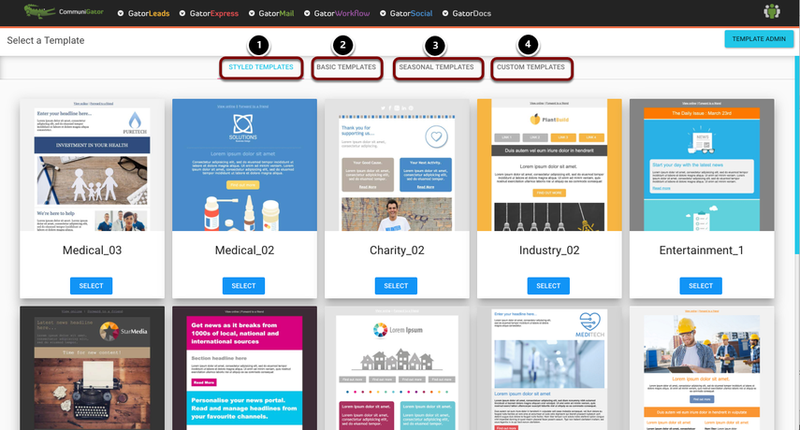 Styled templates - examples of layouts using colour and imagery to help you visualise how your campaign could look. These are customisable once you select the template, and any changes you make will not overwrite this example template. 2. Basic templates - examples of templates in grey-scale with placeholders instead of images, providing you with a blank canvas to build your email creative. 3. Seasonal templates - examples of festive templates available for you to use. 4. Custom templates - you'll find the templates our design team have created especially for your instance here. The first options you'll be presented with is whether you'd like to 1. run the setup wizard, or 2. go straight to the content. Please note, the editor is disabled until you have selected an option. 1. Yes, I'd like to run the setup wizard: You'll be presented with a few options to set your primary, secondary and tertiary colours (we recommend using your company colour palette). 2. No, take me straight to the content: as it says on the tin, get stuck in. 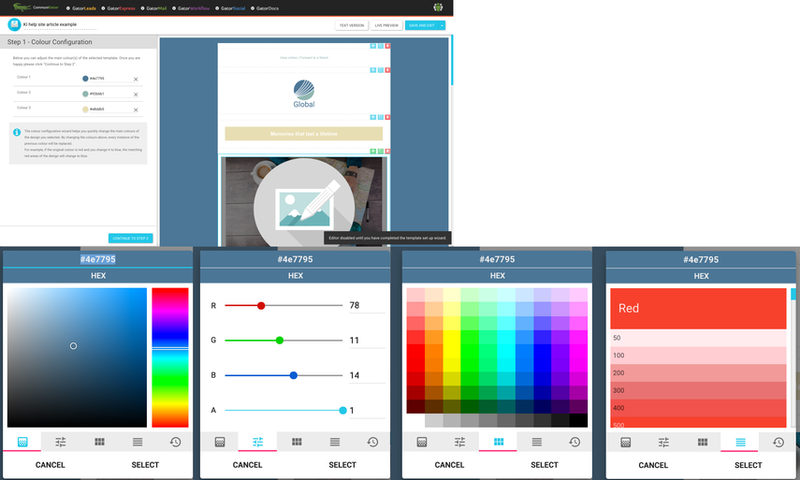 Click on the colour tabs to customise the template according to your palette. Click 'Select' when you've chosen your colour. There are four different colour swatch slots available to choose your colours, as well as being able to input hex codes, and once you've used the tool more, a recently selected tab. After choosing your main colour palette you can set the overall style (a bit like CSS). Here you can select the defaults for page and module colours, font, size, and link styles. Once you've completed this step, you can click 'Finish Wizard' to start customising your modules and content. 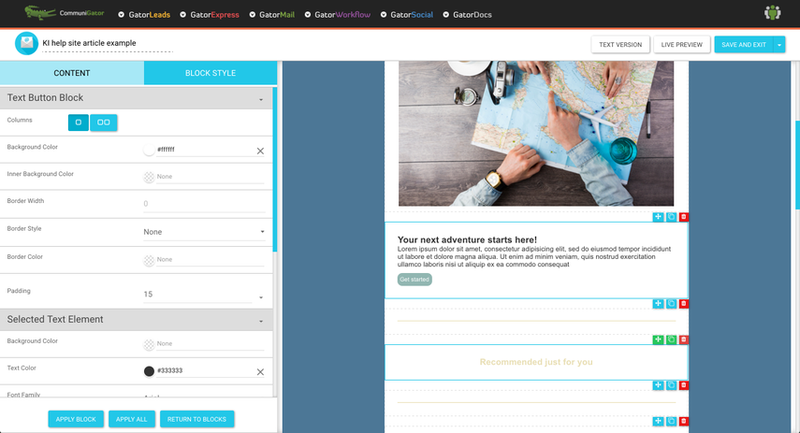 The blocks on the left show the various options you can drag onto the email canvas to build your creative. Unless marked with a number, the icon depicts the layout of the module. 1. Email Links: This is typically used in the pre-header of the email and contains 'View Online' and 'Send to a Friend' links. 2. 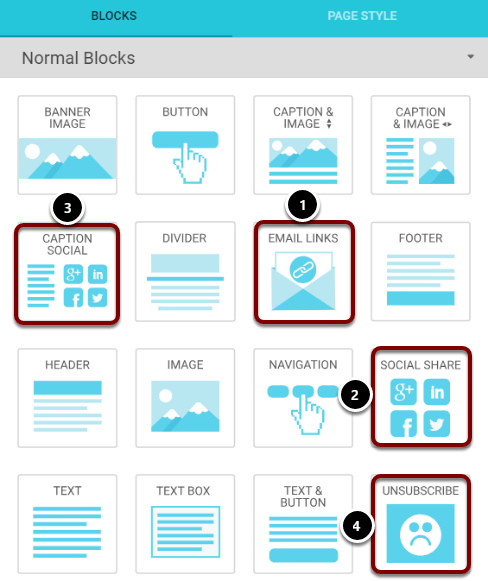 Social Share: This block allows you to link to your social media pages using the official icons. You can add or remove using the dropdown list within this block. 3. 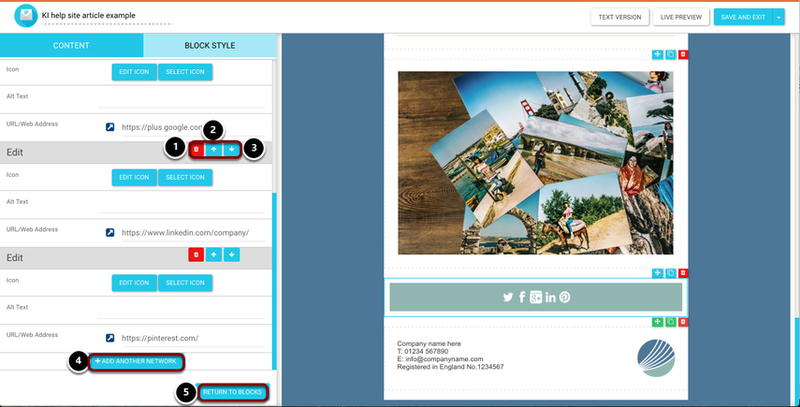 Caption Social: This block allows you to add social links with a caption for your company details and any other text you wish to add. 4. Unsubscribe: This module contains the standardised opt out wording and link. 3. View the text version of your creative. 4. Preview your creative - with options to view your preview responsively, on desktop and inbox. 5. Next to save and exit, there is a dropdown arrow which allows you to save what you have done as a template. 6. On each module you'll see the red bin icon, which allows you to delete that module. Please note: there is no undo option. 7. The icon allows you to duplicate the module you have selected. 8. You'll also see the option to move the module by dragging it up or down the canvas. 9. If you're editing a module, 'Return to Blocks' lets you finish editing and return to the main options. Your content is automatically saved as you make changes, so you only need to manually save when you're exiting the editor. The options in the section apply to all modules that contain text elements. Please note: this is not a design, it is purely to help illustrate controls. 2. As illustrated, this is the background colour of the module. 3. As illustrated, this is the background colour of the content, within the module. 4. Controls border settings: border width must be specified for these to apply. 5. 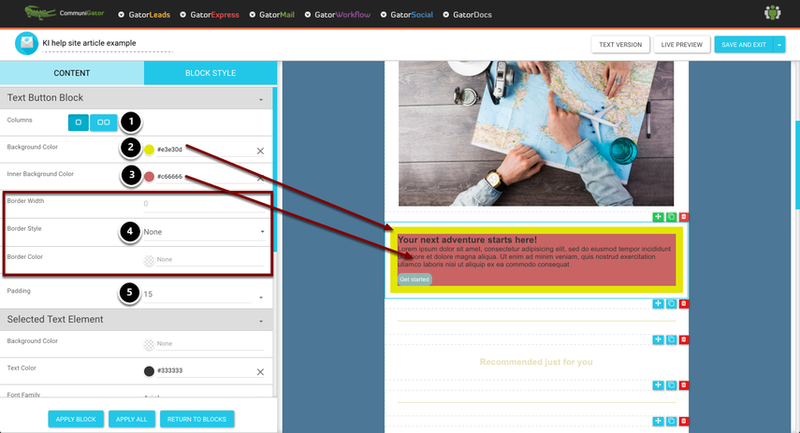 Padding controls the margin between the edge of the content and the content itself. Double click on the text to edit the copy and how it looks. Highlight the text to update the format, such as underline, bold, colour, links and more. You'll also be able to add tracked links, landing zones, surveys, confirmation opt in, unsubscribe and view online using the symbols you may be familiar with from using GatorMail editor. 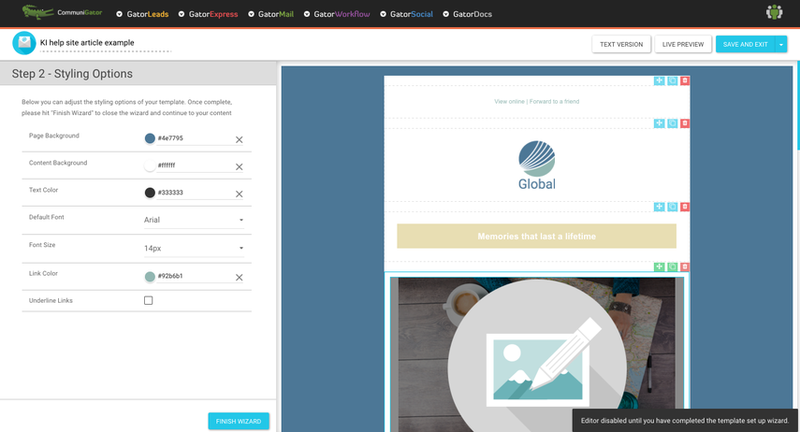 When editing the Social Share module, the left menu will show the options available. 4. Add another network: click here to select the available options. 5. 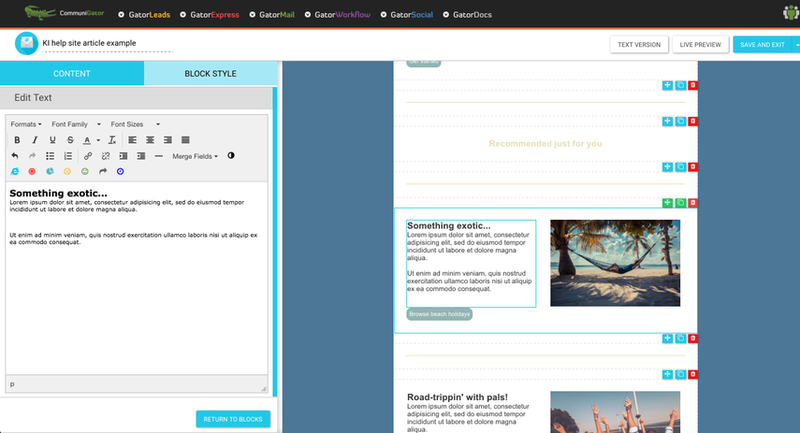 Once you've finished, click return to blocks to continue customising your creative. In page style you can set the page background colours. Here you can select the colour you want your background to be. You can enter your HEX code or select a colour from the colour selector. You can also have an image as your background. This allows you to create much more personalised and gripping emails to match a theme or brand. If the image can't display in the recipients email client, then you can choose a background colour to fall back on. We highly recommend doing this to ensure your email design appears correctly. Prev: What Gator Creator can do for you!